memory is subdivided into two 16GB pools, each of which is connected to a GPU over a 256-bit bus. The Polaris Pro Duo offers 11.45 TFLOPS of peak single-precision compute performance, a significant drop over the 16.38 TFLOPS of throughput its Fiji-powered predecessor offered. The new Pro Duo slots into a more thermally-friendly 250W board power rating, however, down from its forebear's 350W rating. The updated Pro Duo no longer needs liquid cooling to do its thing as a result. The card can drive four 4K monitors at 60 Hz, one 8K monitor over a single cable at 30 Hz, or one 8K monitor at 60 Hz using a dual-cable setup. 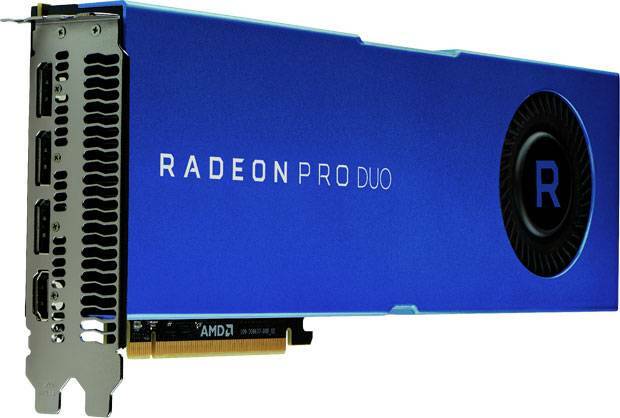 AMD expects the new Pro Duo to fill many of the same shoes its predecessor did. The card could be particularly useful in VR content creation, where AMD touts the Pro Duo's support for its LiquidVR dual-GPU rendering SDK in the popular Unity and Unreal engines. The company also expects that professional applications and plugins already geared for use with multiple GPUs will also enjoy substantial performance boosts over single-GPU pro cards like the W7100X. AMD further claims the resources of the Pro Duo's twin GPUs can be divided between multiple 3D rendering applications at once for higher multitasking performance in content-creation workloads, as well. We expect the primary appeal of the card will be its ability to crunch through much larger data sets than its predecessor could. 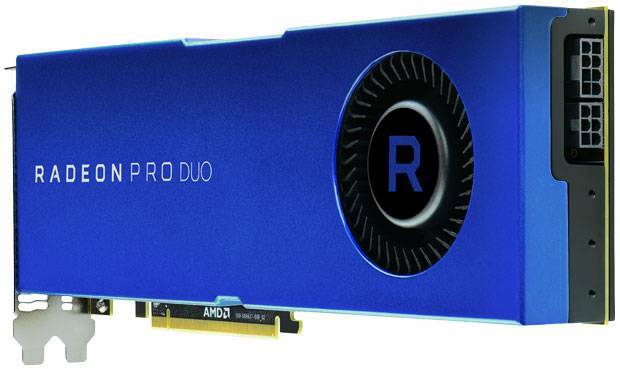 As a Radeon Pro card, the Pro Duo will come with 24/7 support and ISV-certified drivers. The company appears to be abandoning the simultaneous professional and consumer driver support concept from the original Pro Duo in favor of a fully professional-grade approach this time around. AMD expects that the card will become available at the end of May for a $999 suggested price tag.